Three distinct cottages to choose from. Kayak the Atlantic Ocean or bike Cape Ann's gorgeous cliffs. Board games, HDTVs, free wireless internet all available for a rainy day. Barbeque in the spacious back yards or walk 2 minutes to the beach. If you are looking for a location for a summer rental North Shore MA is an excellent option to consider. Located in the town of Rockport on the Massachusetts coast, Rockport Cottages offers some of the most relaxing and comfortable accommodations in the region. These picturesque seaside homes were built by local fisherman many years ago, and they have stayed in the same family to this day. 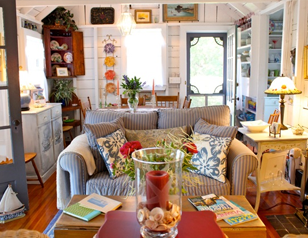 Each cottage is a peaceful place to call home while you enjoy the sights and sounds that make the Eastern Seaboard so inspiring and unforgettable. When you're not lounging around your cozy cottage, there are plenty of exciting things to do in Rockport. Guests should be sure to check out Bearskin Neck, a popular shopping destination where you can browse souvenirs, art, handmade crafts, and specialty items. Of course, if you plan on spending some time at the beach during your summer rental North Shore MA is the place to be. Front Beach is a two-minute walk from the Cottages at Rockport, and there are plenty of bathrooms, lifeguards, and eateries in the area. Those with a thirst for adventure and exercise can explore the rolling waves of the Atlantic by kayak. You can also take a tour on one of our bikes to find some of Cape Ann's gorgeous cliffs and swimming quarries. Contact us at (978) 290-4022 if you would like more information on the Cottages at Rockport.